Overview of Pre-diabetes by Jacquie Sheffield. Diabetes Nurse Jacquie Sheffield gives an overview of Pre-diabetes and why it is important to know if your sugar level is raised. 50% of people found to have Pre-diabetes will go on to develop diabetes over a decade. It is more common if Type 2 Diabetes runs in the family, in those of south-east Asian descent and in overweight individuals. How Pre-diabetes is diagnosed and monitored. Prediabetes is diagnosed by a blood test which checks for your longterm sugar level, called your HbA1c level. We recommend that you have this level checked every 6- 12 months depending on your sugar level. Diabetic levels: HbA1c 48 and above. When you have Pre-diabetes, it is important to monitor your weight and blood pressure, at least once a year. 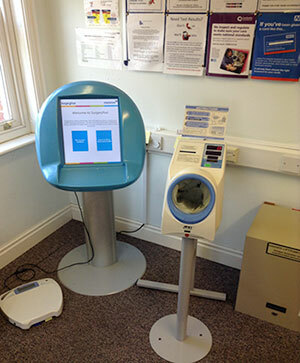 At Priory Medical Group: we have self-monitoring pods, which are available to use at your convenience. Your results will be saved in your clinical records. If your readings are raised a clinician will be touch with you. If you are overweight and plan to make lifestyle changes, you may wish to check your weight and BP every three months to see the positive effects on your health. At Priory Medical Group, our Diabetic Specialist Nurses run regular sessions each month at Heworth Green and Cornlands Road surgeries. If you wish to speak to a member of the Diabetes team about your Pre-diabetes, telephone appointments are available throughout the week.